Slightly more cheese than I would use, but this is a version I would like. I don’t know who creates these days, but I’m on board for this one. Here are my thoughts on this beloved national treasure. A grilled cheese sandwich makes an amazingly good breakfast. KISS: Keep it simple, stupid. I don’t want your four cheese, truffle oil, on brioche BS. That’s apostasy. The bread should be plain white sandwich bread. Sourdough (which I love) can do in a pinch, but other “better” breads do not make a good grilled cheese. I’ve used all sorts of cheese of various quality and none can beat be processed, American cheese. It melts like a dream and tastes yummy. My particular favorite these days is Kraft Deluxe. Better than the individually wrapped version, and without the hassle of the cellophane. They were fun to unwrap as a kid, but I don’t need that as an adult. 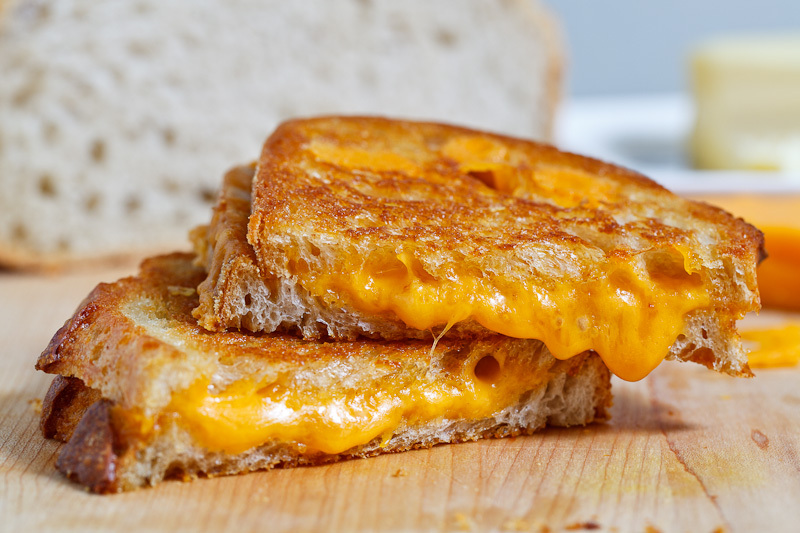 Don’t be fooled by the name, a grilled cheese sandwich should not be grilled. It should be made in a skillet or on a griddle. If your butter isn’t soft enough to spread–or you don’t have any butter–use mayonnaise. Say what? Yes. John’s brother taught me this trick, which I think he said he learned from Martha Stewart. Instead of spreading butter you just spread mayo. It grills up very much like butter does and I think it is hard to tell the difference, it doesn’t taste like mayo at all. For dunking I really enjoy a canned tomato soup. I’ve had high-end soup with a high-end grilled cheese and it didn’t hold a candle to the original. Cut the sandwich on the diagonal. This is especially important if you are going to dunk. Make yourself two. You know one isn’t going to be enough. At first glance this looks good, but the shininess of the cheese lets me know they used real cheese, probably cheddar. It just doesn’t melt as well. And the bread would make delicious toast, but but quite right for the GCS. This is exactly how I make them. Step by step. Australian’s grill them or put them in a type of sandwich press that gets hot like a waffle. Not me, straight onto the stove top, buttered on both sides. Very good. Sometimes though I put in a sweet pickle. Always with tomato soup. Sliced tomato or ham is also good inside. I’ve never put pickle in them but I love sweet pickle spears on the side. My mother used to make a sort of open-faced grilled cheese under the broiler which she would then add yellow mustard. I found this disgusting as a child but as an adult I have found that a little Dijon spread on the insides of the bread (the side touching the cheese) is also nice. And I agree that American-style cheese is best though I would be willing to combine it with other cheeses. Now I think I know what I’m having for dinner! Butter both sides of the bread: this is key. And I too like a sliced tomato inside, but only a real tomato. I shall have a go at this technique tomorrow – probably will end up being very messy. One departure from your instructions for the perfect sarnie though – I will not be using American cheese. Sorry but this doesn’t even count as cheese to me. I’ll be going with a good old British cheddar…..
Yum! This is a celebration I can get behind. I can’t cook but I can boil and egg and I can make a grilled cheese. I also add tomato slices when available as suggested above. I think I will try the mayo / butter both sides tonight and see how it goes. That grilled cheese looks DELICIOUS! I am craving one now :) Thanks for the tip of buttering both sides of each slice of bread – I’m so doing that now. 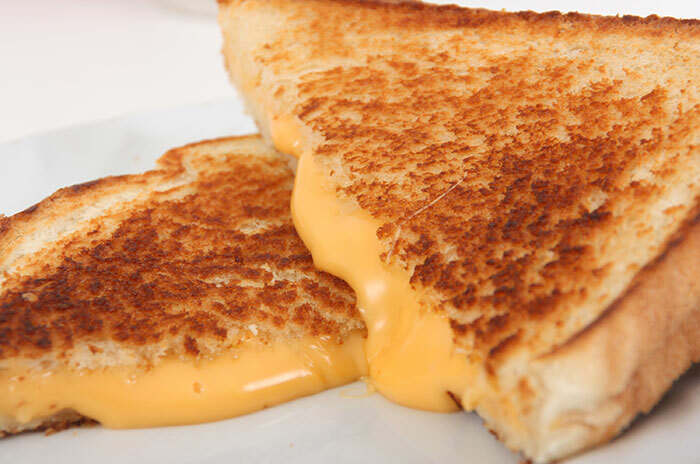 I am kicking myself for not knowing that yesterday was National Grill Cheese Day! It was probably the first thing I ever cooked as a kid. During summer vacations, that was lunch almost every day. Today I think I will bring out the frying pan and honor the humble Grill Cheese Sandwich.